Comcast Sportsnet made it official today, announcing that local product and former major leaguer Ben Davis will join their 2015 Philadelphia Phillies broadcast team. At the completion of the 2014 season, former pitcher and hometown hero Jamie Moyer informed the team that he would not be returning to the broadcasting booth in order to focus more time on his family and charitable endeavors. With the popular Moyer gone just one season into his career behind the mic, the search was on for a new color commentator to join the team of Tom McCarthy, Matt Stairs, Gregg Murphy and, on Sunday home games, Mike Schmidt. There were reportedly a number of individuals considered for the position, the leading candidates rumored as Ben Davis, Mickey Morandini, and Kevin Stocker. Phillies fans are already extremely familiar with the Chester native and Malvern Prep product who was a 1st round MLB Draft pick of the San Diego Padres back in 1995. Davis has been a popular pre and post-game show host and commentator on Phils broadcasts with CSN. During his 7-year career in MLB, Davis played for the Padres from 1998-2001, the Seattle Mariners from 2002-04, and then finished his career following a brief stint with the Chicago White Sox in 2004. He fashioned a career .238 average, with 38 homers and 204 RBI in 1,698 plate appearances spread across 486 games. 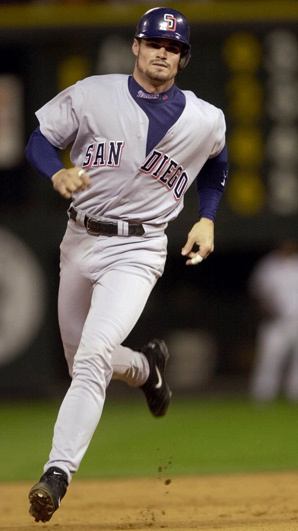 Davis had his best MLB season in his lone year as a starter with San Diego in 2001. The 2001 season with San Diego was his lone as a starter. That year, Davis played in 138 games, received 526 plate appearances, and had a .239/.337/.357 slash line with 11 homers and 57 RBI. Following that strong season, Davis was sent to Seattle as part of a 6-player deal, but was unable to win the starting job. Following that final MLB stint in Chicago, Davis signed a handful of times with MLB organizations as a free agent over the ensuring years. But opportunities with the Yankees, Dodgers, Orioles, and Reds gained him only minor league appearances. He finally completed his pro baseball career with a 28-game stint with the independent local Camden Riversharks. Just three weeks ago, Davis spoke at a dinner to kickoff the baseball season for Lafayette. As reported by their 'Campus Insiders', he stated: "Never get too high and never get too low," he said. "This game will put you in your place. If you overthink this game, it can come back and bite you." The handsome, articulate hometown ex-ballplayer appears to be a perfect choice. He has never been one to hide his feelings regarding difficult situations, but has always shown himself to be fair in his evaluations. In the last few weeks, I lobbied here at TBOH for Davis to get the position. Last season, I gave him an 'A' grade in my evaluation of Phillies broadcasters. Now that he has it, if his in-game skills in any way reflect his studio work, Phillies fans are getting a tremendous face and voice to enjoy on TV game broadcasts for a long time to come.